Indiana Jones and the Temple of Doom is a 1984 American action-adventure film directed by Steven Spielberg. It is the second installment in the Indiana Jones franchise and a prequel to the 1981 film Raiders of the Lost Ark and followed by Indiana Jones and the Last Crusade in 1989 and Indiana Jones and the Kingdom of the Crystal Skull in 2008. 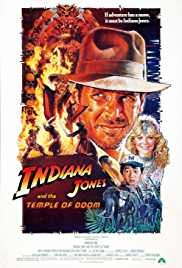 After arriving in North India, Indiana Jones is asked by desperate villagers to find a mystical stone and rescue their children from a Thuggee cult practicing child slavery, black magic and ritual human sacrifice in honor of the goddess Kali.